Well, February; where did you go? Last month flew by and went easy on our finances. We managed to save more money than we planned and came in well under budget. £360.80 under budget to be exact. We STILL haven’t officially got our own Internet. We have given up. Instead we are sharing our landladies/next door’s connection which makes sense; however, she recently switched to Talk Talk and, oh what a surprise, there’s a problem with it so sometimes it works very slowly and the rest of the time it doesn’t work at all. Wow, we did so well by spending so little in February! This is mainly due to the fact that we did a big shop towards the end of January which covered the first week of February. Then, we found our freezer switched off and all the food defrosted. Damn. Thankfully, most of what was in there was meat so we spent the evening cooking many meals. 6 portions of chilli, 2 portions of Moroccan chicken and 4 portions of stew all in one night! The rest of the meat we kept in the fridge and eaten over the next two evenings. Our one and only shop of the month was done on the 18th of February so we lasted pretty well for the majority of the month. We came in £17 under budget probably because the month was shorter by 3 days and the mornings have been mild so haven’t put the bedroom heater on to warm the room when getting up. Under budget for petrol, probably because we filled our tanks up towards the end of January meaning it lasted well in to February. 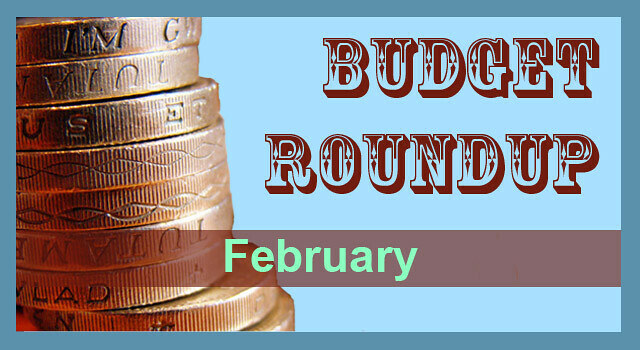 So far we have come under budget both months this year and we have a healthy £560 unspent in the account as a result. We intend to leave this money in the bank for now as a buffer and as a joint emergency fund. We are very happy with how things are going with our shared account and with our savings. We are well on track but as soon as summer arrives I know it will be hard to curb our spending with the temptation of holidays and road trips to the beach on hot Sundays. PS. How did you do this month?